Articulate Quizmaker lets you add blank slides to your quiz for non-question content. 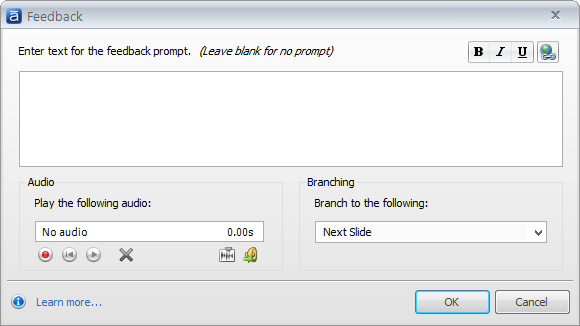 Use blank slides for introductions, summaries, supporting information, etc. And if you decide you'd like to convert a blank slide into a question, you can do that, too. In Question List View, go to the Home tab, and click Blank Slide. A new slide gets added to the question list after the currently selected slide. If no slides are selected, the new slide gets added to the end of the list. In Slide View, go to the Insert tab, and click Blank Slide. A new blank slide opens in Slide View. In Form View, go to the Home tab, and click Blank Slide. A new blank slide opens in Slide View. Unlike question slides, blank slides only have a Slide View, not a Form View. After adding a blank slide, you're ready to fill it with content. See Inserting and Customizing Slide Content and Inserting and Customizing Media. 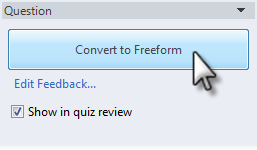 Click the Convert to Freeform button in the Question panel on the right side of the slide workspace. Click the thumbnail image for the type of question you want to use. 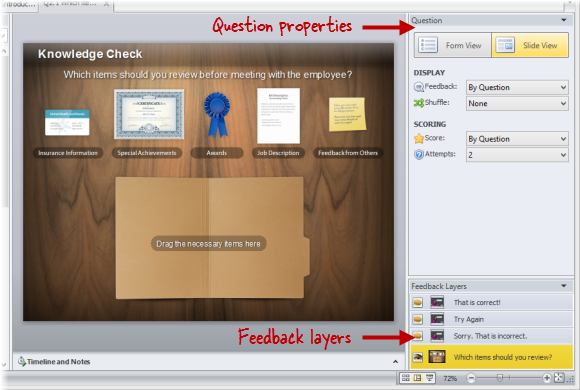 Several options will appear in the Question panel, and feedback layers may also appear in the Feedback Layers panel. 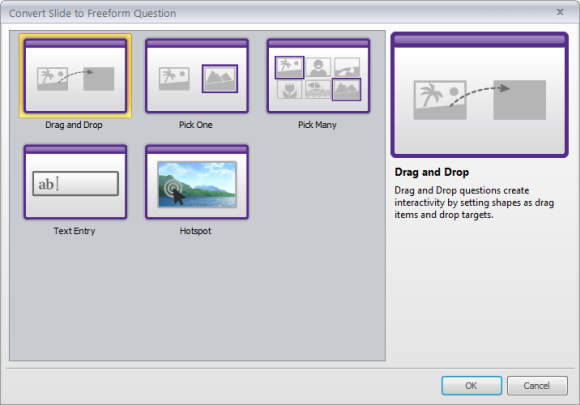 In Slide View, go to the Insert tab, and click Remove Freeform. Click OK to confirm. In Form View, go to the Home tab, and click Remove Freeform. Click OK to confirm. In Slide View, click Edit Feedback in the Question panel on the right side of the screen. When you add feedback to a blank slide, Quizmaker adds a Thank You layer in the Feedback Layers panel in the lower right corner of the screen. 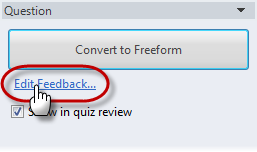 You can use the feedback layer to further modify how your feedback will look to learners. To learn how, see Working with Feedback Layers. To give your feedback layers a consistent design throughout your quiz, see Using Feedback Masters. You have the option of including blank slides when learners review your quiz. In the Question panel on the right side of the slide workspace, mark the box to Show in quiz review. Uncheck the box for any blank slides you don't want learners to see during quiz review. 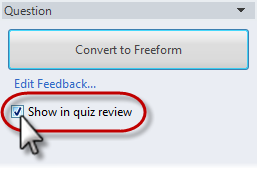 To turn the quiz review feature on or off, see Editing the Result Slide.